William John Kenny, the son of John and Anne McDonough Kenny, was born in upstate New York in 1853. In 1862, he and his family moved to Scranton, Pennsylvania where young William attended public schools. When he was old enough he entered the employ of The Scranton Republican, a local newspaper, and received a wage of $3 per week as a press feeder. His efficiency and work ethic attracted the attention of his employers and, within three months, he was awarded the position of pressman at a weekly salary of $14, a handsome amount for the years at the conclusion of the Civil War. William Kenny remained in newspaper work until he saved enough money to put himself through college. At the age of 19, he enrolled in St. Bonaventure College at Alleghany, New York where he was recognized as a student with exceptional talent. When he received his bachelor’s degree three years later, he was also awarded an honorary master’s degree. It was during his years of study at St. Bonaventure that William accepted God’s call to the priesthood. After completing his theological studies, he petitioned the Bishop of St. Augustine for acceptance into the diocese. Bishop John Moore willingly received him and ordained him to the priesthood on January 15, 1879. Father Kenny was assigned as curate at Immaculate Conception Church in Jacksonville for a few months after which time the bishop sent him to serve at the mission church of St. Monica in Palatka. In June of 1884 he was appointed by Bishop Moore as the pastor of Immaculate Conception, the only Catholic Church in Jacksonville. Father Kenny worked tirelessly to build the parish into a thriving community of faith. The period from August to December 1888 would test the young pastor, the only Catholic priest in the only Catholic parish in the city of Jacksonville. An epidemic of Yellow Fever decimated the city and, during that five-month span, more than five-thousand people became seriously ill and more than 400 died. Father Kenny brought the sacraments and much comfort to those suffering at home and in hospitals. Burials had to be done quickly in order to avoid further contagion and many days saw him almost constantly at the cemetery, conducting the rites of church burial. During that time when Father Kenny, himself, became ill, Bishop Moore came from St. Augustine to the parish of the Immaculate Conception to allow for Father Kenny’s recuperation. Three years later, Father Kenny’s faith and spirit of determination would be tested again. At about noon on May 3, 1901, a small spark from a stove in the LaVilla area touched off a devastating fire. Approximately eight hours later when the fire was controlled and contained, 466 acres of the city had been destroyed, 2,368 buildings were gone, 8,677 people were homeless but, miraculously, only seven lives had been lost. The city of Jacksonville was in ruins. Father Kenny’s church, rectory, convent, parish hall, and St. Mary’s orphanage, operated by the Sisters of Saint Joseph were reduced to cinders; and all that remained of Father Kenny’s personal possessions were the clothes that he wore as he ministered to those in need of help. While Father Kenny was busy taking care of the restoration of Jacksonville, another burden was to be placed upon him. Two months after the great fire, Bishop Moore died and shortly thereafter, Father Kenny was chosen by the priests of the diocese to serve as diocesan administrator. Then, on March 25, 1902, Father Kenny was appointed by Pope Leo XIII to be the third bishop of St. Augustine, the first American-born priest to hold that position. “In view of the fact that Bishop Kenny is a man of limited means, and that he lost what little he owned in the fire, a cash offering to help him defray the expenses of his consecration and enable him to purchase vestments, was decided on by his friends. In thanking the presentation committee, Bishop Kenny stated that the expression of their esteem and friendship, aside from the generous token, was one of the most pleasurable moments of his life. Not only in Jacksonville is Bishop Kenny esteemed and loved. The announcement of his appointment to the vacant See was hailed with joy all over the state. He is well known in all parts of Florida and everywhere regarded with the same affection displayed in Jacksonville. Zealous, self-sacrificing, possessed of rare talents, clear judgment and indomitable courage in his work, he is eminently fitted for the lofty station to which he has been called.” These were truly remarkable words at a time when anti-Catholic feelings were common throughout the country, and especially in the South. On May 18, 1902, Father William Kenny received Episcopal consecration through the hands of James Cardinal Gibbons, Archbishop of Baltimore. Cardinal Gibbons was assisted by the co-consecrators, Bishop Kieley of Savannah and Bishop Haid of North Carolina. This sacred rite took place in the Cathedral in St. Augustine and the crowds spilled beyond the church. A special train had been arranged to carry the crowds from Jacksonville. 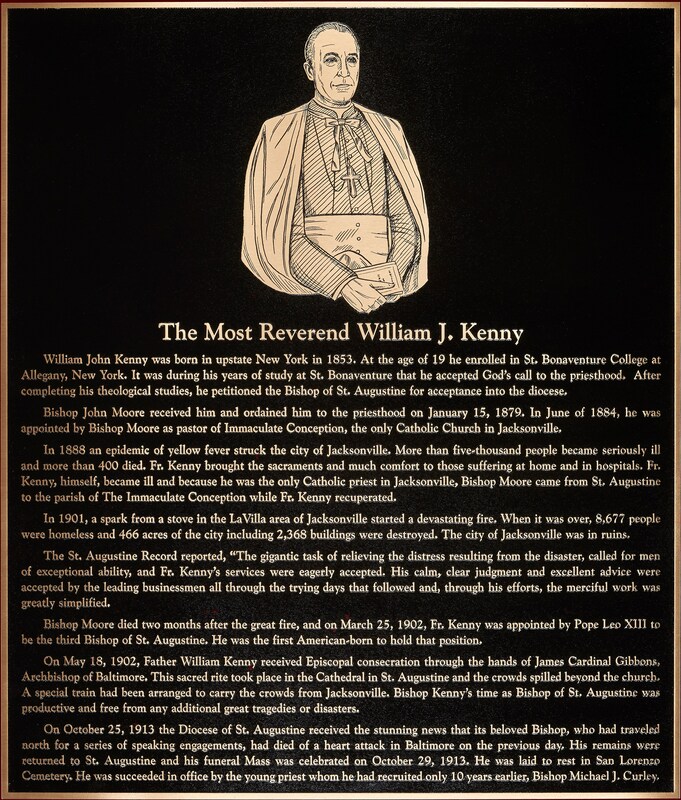 Bishop Kenny’s tenure in office was free from any additional great tragedies or disasters. He spent most of his time visiting his parishes and mission stations scattered throughout Florida. He also spent considerable effort recruiting priests who were willing to minister in his missionary diocese. One, whom he called in 1903, came from Ireland and, eleven years later, would become the youngest bishop in the United States. Bishop Kenny established Assumption Parish in Jacksonville, a mission church at Jacksonville Beach and a school in Fort Pierce. In early October of 1913, he left St. Augustine for a series of speaking engagements in the North. His primary purpose was to recruit young priests for the Florida missions. On October 25, the Diocese of St. Augustine received the stunning news that its beloved bishop had died in Baltimore on the previous day. Although he seemed to be in robust health, he had suffered a heart attack. His remains were returned to St. Augustine and his funeral Mass was celebrated on October 29, 1913 and he was laid to rest in San Lorenzo Cemetery. He was succeeded in office by the young priest whom he had recruited only 10 years earlier, Bishop Michael J. Curley. In September of 1952 Central Catholic High School opened its doors at 1055 Kingman Avenue in Jacksonville, Florida. Archbishop Hurley solemnly blessed and dedicated the school on November 2nd of that year. Two months later, on January 15, 1953, Archbishop Hurley announced that he would honor The Most Rev. 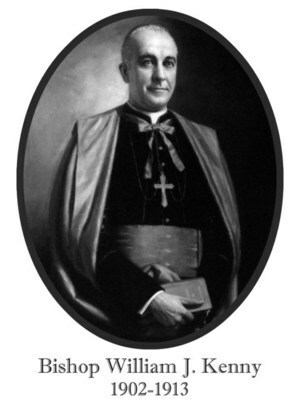 William J. Kenny, Third Bishop of St. Augustine by renaming the newly opened Central Catholic High School in his honor. The announcement was made on the same date as Bishop William Kenny’s ordination to the priesthood, precisely 74 years earlier. We thank Deacon Richard Ryan, Rev. Michael Morgan and Sister Suzan Foster, SSJ for their contributions to this article.